Our crews are made up of experienced and professional members. 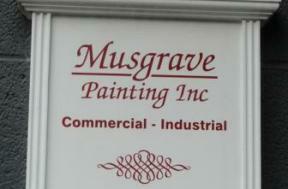 We use only the best paints and have a large variety of colors to choose from. We do our best to understand exactly what you want before we get started. Our Electrostatic Division will use their skills and experience to electrostatically paint your equipment, grocery cases and other other metal surfaces to a like new shine and our Commercial/Industrial Division can paint the interior or exterior of your office building or home to your personal specifications.